Jun 20, 2010 - Setting the Standard for Quality in Native American Arts. We had a wonderful surprise this week when we opened Monday's, October 29th, 2007 edition of the Albuquerque Journal and found ourselves featured on the front page complete with a color picture. We truly have been blessed in this business, with years of working with talented artists and the opportunity to represent their hard work to people like you all who appreciate beautiful things just like we do. We love to make people happy. In fact, that's pretty much our bottom line. So, to be recognized for doing what we consider our job, it's pretty nice to be appreciated. In any case, good news stories are rare, so we thought you might enjoy reading this one. Nan Montegrande says the $1,300 she gave Tanner Chaney Gallery in Old Town in 1992 as a deposit for a Maria Martinez pot is really no big deal in the grand scheme of life. What was important was what Tom Baker, who owns and operates the gallery with his wife, Laura, did when she came to claim the deposit 11 years later. Misfortune had struck Montegrande and her husband, causing them to forget about the transaction. Years later, when they sought out the shop, Baker still had the paperwork on file. Although Baker no longer had the Maria Martinez pot, he let Montegrande use the $1,300 as in-store credit. And he treated her that day like she was spending cash, she said. "This man is a very rare person," she said. "I fully expected to write off the money as lost." Baker shrugs off any suggestion that he is anything but a businessman. "We made a guarantee. We had to honor it," he said. And even though the redemption of in-store credit happened four years ago, Montegrande? who lives in California? said it has not been forgotten. At 63 and dealing with cancer treatments, Montegrande said she wanted to make sure Baker got his due and e-mailed the Journal with her story. She said that it is easy to gloss over and forget good deeds done by strangers but that, in the end, we are only fooling ourselves. "These little lies of convenience are part of our mentality anymore," Montegrande said. "I just wanted Mr. Baker to get some credit." Baker, in turn, credits his wife, Laura, with keeping excellent records. The couple have not thrown away a single record since they opened their gallery in Old Town 20 years ago. For years, Montegrande and her husband, Valentino, made a sojourn to New Mexico every other year to shop at Santa Fe's Indian Market. The couple would fly into Albuquerque and drive up to Santa Fe. 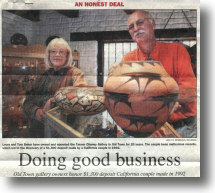 In 1992, they stopped by Old Town in search of Indian pottery, which they collect. In the Tanner Chaney Gallery, they found a small pot made by famed New Mexico potter Maria Martinez. They put a $1,300 down payment on the $4,000 piece and expected to pay the rest after several months. After returning to California, the couple were in a horrific traffic accident. The accident had more than a physical impact on the couple's life, and Montegrande said they dedicated themselves to healing and forgot all about the pot. The receipt and several letters the Bakers had sent to the Montegrandes were lost, and neither thought much about the down payment until 2003 when they found themselves walking through Old Town again. Montegrande said she couldn't remember the name of the gallery and went to several, asking if they had records of the deposit. She said she knew it was an outside chance that they would find the gallery. But they did, and they discovered the Bakers had a record of the transaction. Baker said the pot had been in the gallery on consignment and was eventually sold. But, with the store credit Baker gave them, Montegrande said they picked out several pieces to add to their collection. 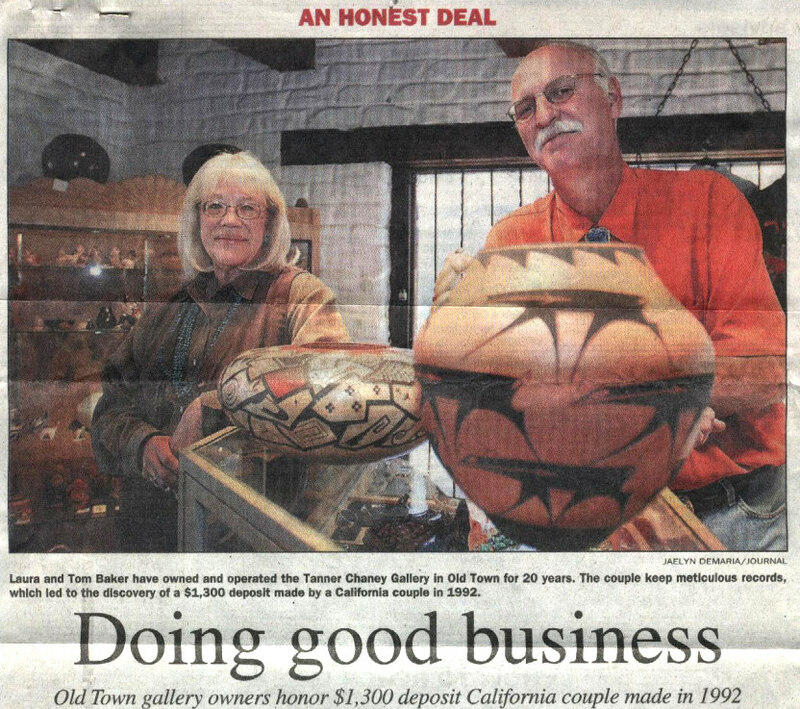 The Bakers opened the gallery with two partners in 1987, selling Indian jewelry and pottery. For years, Tom Baker said he had worked in the wholesale side of the jewelry business, which meant he traveled a lot. The couple decided to settle into the retail side of the business because "it's easier to raise a family when you are at home," Tom Baker said. He said the couple's approach to business is simple? treat every customer in the same manner, with respect and integrity. The Bakers say 11 years is a long time to hold on to a $1,300 deposit, but not unheard of for the gallery. "We had someone put a rug on layaway about 10 years ago," Baker said. "We haven't heard from them in six years, but we still have the rug. We'll keep it for them as long as we're here."